This contemporary design shower panel system is equipped with six body adjustable jets, rainfall showerhead, and an elegant hand shower. Swivel rainfall showerhead allows you to adjust to the angle you desire. This shower panel features an adjustable sliding rail, fog-free mirror, thermostatic valve, built-in volume control/transfer valve, and 4-way water diverter. 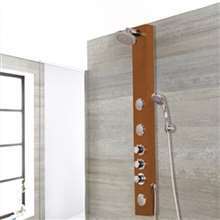 This shower panel will provide the benefits of massage to improve your internal energy flow. Custom swivel nozzles providing you with a concentrated massage on any desired parts of your body. Adjustable Sliding rail hand shower. Swivel rainfall showerhead allows you to adjust the spray to the desired part of the body. Equipped with a state of the art anti-clogging system. Self-cleaning mechanism (Extends shower head life). Manufactured from high-quality brass flex-hose. Exceptional durability for longer life. Engineered from high-quality products that will hold up to the maximum water pressure. Allows you to run any function separately or as a combination. Easy Installation "Easy to Install", does not require any special workmanship. Shower Panel Dimensions : H 52" x W 10.5". I was lucky enough to have caught his while it was on sale, otherwise I may not have considered buying it. The huge price cut actually made me a bit nervous about the quality of this thing, but so far it's been working perfectly. The installation took a while, but they were able to get it to work and there's been no problem ever since. I kind of thought that this was pretty expensive at first, so I decided to look at the shower systems here. After a while, I decided that this is more affordable than the ones I saw, so I got it. So far I 'm quite pleased with my decision, and have no regrets in getting this one. It looks fine and works as expected. The delivery took a while, but the wait's worth it. We bought this one because it was well within our budget. In fact, the sale price, I think, is the strongest selling point of this thing. Don't get me wrong, the quality is okay and so are the features. Nothing spectacular, but certainly worth it when you consider the price point. This is the first time I've ever had a shower panel installed at home, but so far I'm really liking it. I had this one installed in the master en suite, and after using it for about a month now, I can say that this is a good one in terms of function and quality. It doesn't look as fancy as the other shower panels here in the site, but it is pretty in its own way. I also think that the price is reasonable for what you're getting. After thinking it over, we decided to give one of these shower panels a try and had one installed in one of the executive suites. We tried it out ourselves, and though we were pleased with the results, we wanted to get our guests opinions before coming to a conclusion. Well, we've had nothing but great comments about it, and we're now thinking about installing shower panels in all the remaining rooms. We'll take a look at the other shower panels for variety, but this one actually works well and is great value for money.